We're proud to release the official MTGGoldfish Chrome browser extension. The extension brings key MTGGoldfish features to all sites you visit. It adds popups for card images and ONLINE/PAPER prices to all websites you visit. You can also select decks in your browser and price them with our Deck Pricer. It also comes with usability features like disabling/enabling on certain pages and domains. Give it a try today (it's FREE) and I would love to hear your comments! You can also do us a solid by rating it and sharing it with your friends! This week we have a lot of releases on MTGO. Obviously we have the KTK release events, but From the Vault: Annihilation and Duel Decks: Speed vs. Cunning are also being released online! Pro Tour KTK is also coming up this weekend! Oct 6: KTK Pre-Release Ends. Oct 6 - 22: KTK Release Events. Oct 6: From the Vault: Annihilation Release on MTGO. Oct 6: Duel Decks: Speed vs. Cunning Release on MTGO. Oct 8: Constructed queues will payout in KTK packs instead of M15 packs. The site has been fully updated to reflect standard rotation. Checkout the latest KTK-standard decks on the Metagame page, or see pricing trends for KTK-standard on the Standard Total Price Index. You can also scour the internet for the latest deals on KTK with our Deal Finder. 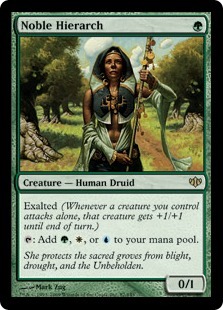 Remember, you can also buy your MTGO cards via the web from our sponsor Cardhoarder. You can find links to Cardhoarder on our individual card price pages, or even purchase entire decks from them via our deck pages. Monastery Swiftspear foil-version is a $20 card. Pretty good for an uncommon right? It plays a similar role to Goblin Guide and Delver of Secrets in eternal formats so its foil price is high relative to its non-foil price (only $1). Is $20 reasonable? It's probably a bit high. Delver of Secrets foil-version is about $15 now. Delver of Secrets is only a Common, but arguably a much better card. Young Pyromancer is an Uncommon and more comparable, is at a whopping $50 right now (buyout?). Prior to the spike it was $15. 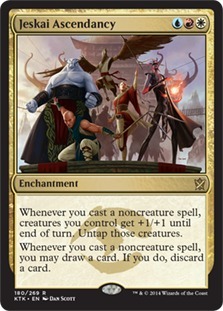 So if Monastery Swiftspear turns out to be the real deal, it should end up in the $15 range. 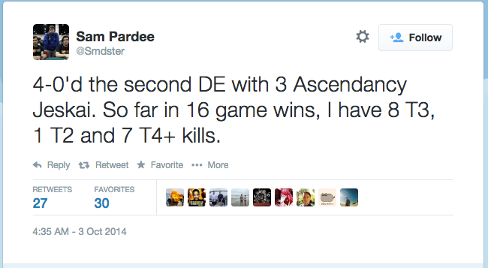 Sam Pardee has been testing out Jeskai Ascendancy in modern and apparently it's really good. 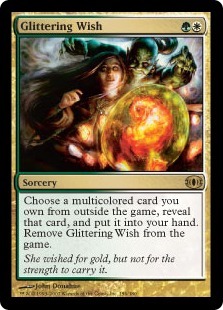 So good that it pulled Glittering Wish from bulk rare status (ONLINE: 0.70, PAPER: $2.50) to a modern powerhouse (ONLINE: 7.00, PAPER: $18.30). The plan of attack is to play some mana dorks, get a Jeskai Ascendancy out, then play a bunch of cheap cantrips. Each cantrip untaps your mana creatures (providing more mana) while growing them +1/+1. You loot away cards you don't need and keep cantripping. Your mana dorks will become suffiently large to kill via attacking, or you can cast Glittering Wish for Flesh // Blood to shoot your opponent in the face for lethal. In 16 games, Sam has had 8 turn-three kills, 7 turn-four kills and 1 turn-two kill. Is this deck too strong? It's too soon to tell since the metagame hasn't had enough time to react yet. But we all know Wizards doesn't like T3 kills in Modern, and Wizards doesn't like solitaire (see: Eggs).